Do you dream of looking like a Hollywood movie star on your wedding day? The highlight and contouring method has been extremely popular lately among celebrities, and with the expert make-up artists at Suzanne Morel Face and Body Care, you as a Cabo bride can have this look too! A good make-up artist can work miracles, and most brides tend to underestimate just how flawless their make-up can look in the hands of the right professional. Our make-up artists specialize only in bridal make-up and are always trained in the latest make-up trends and techniques. 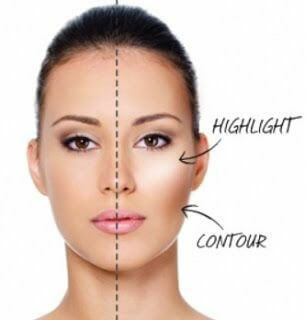 Thd highlight and contour technique is based on how the artist applies different foundations and powders to the cheeks, forehead, nose and chin. That’s right, the perfect cheekbones and svelte faces of Kim Kardashian and other famous stars is all in how the make-up is applied! If you don’t want the heavier glamorous make-up look for your bridal make-up, don’t worry. Our make-up artists can also use highlighting and contouring to show off your best features in a more natural way, so you look fresh and glowing on your big day. Whether your beach wedding look is a spectacular medium to heavy look or an absolutely natural style, our expert make-up artists will use their 10+ years of experience to deliver a wedding-day look that will amaze you! Don’t forget to book a trial at our salon to see exactly which make-up look you love most. We are here to guide you and answer all your bridal make-up questions, so give us a call to learn how we can help you look and feel your best on your most important day! This entry was posted in Cabo Bridal Hair and Makeup and tagged bride contour, bride contour and highlight, bride highlight, Cabo best bridal salon, Cabo bridal salon, cabo bride makeup contour, cabo kardashian, cabo makeup experts, cabo professional makeup, cabo scarlett johansson, cabo wedding hollywood, Cabo wedding makeup, hollywood makeup, los cabos bridal salon, Los Cabos wedding, los cabos wedding makeup, los cabos wedding professional makeup, mexico professional makeup, Mexico wedding makeup, professional makeup in cabo. Thank you so much! This is definitely an astonishing web site!. on your own? Either way stay in the excellent quality writing, it is actually rare to discover a great weblog like this one nowadays.. I appreciate you choosing the time as well as to place this content together. exactly, it was still worthwhile! challenges. It absolutely was really informative. Your website is extremely helpful. Thanks a lot for sharing!